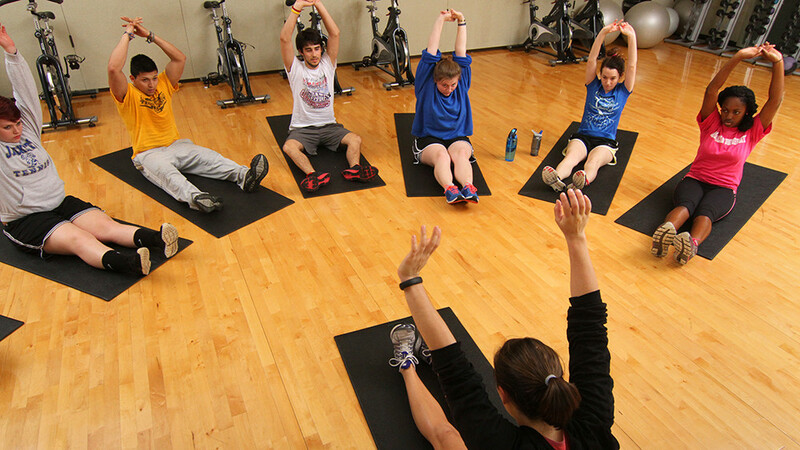 View the Spring 2019 group fitness schedule. Lindsay Mitchell graduated at Oklahoma Baptist University in 2013 with an Exercise Physiology and Wellness degree. She is currently the Wellness Coordinator at the RAWC. She is beginning her fourth year of teaching fitness classes at OBU. She is an AFAA Certified Group Fitness Instructor, NETA Certified Pilates Instructor, NETA Certified Yoga Instructor, MASHUP Certified Instructor and NETA Certified Personal Trainer. She enjoys traveling and running, as she has completed two marathons. Sheri is the mother of two boys, 21 and 19. She earned her Bachelor’s Degree in Social Work from the University of Oklahoma and a Master’s Degree in School Counseling from East Central University. She is in her 21st year of Education and is currently employed as a physical education teacher and elementary school counselor. In 2012, she completed her 200 hour yoga teacher certification from YogaLife in Norman, OK. She teaches Balanced Body at the RAWC on Monday’s and Wednesday’s. After graduating from college in her hometown of Memphis with a degree in Education, Amy immediately moved to West Africa with her husband Jonathan. While she was in Africa, Amy taught physical education for kindergarten, elementary, middle and high school, while she was teaching high school health and Bible. After her two years in Ghana she moved to snowy South Bend, Indiana so that Jonathan could work on his PhD at Notre Dame. In their sixth and final year in South Bend, Amy became a certified Barre instructor and taught a variety of Barre and sculpt classes. Amy has always enjoyed exercise and is very excited to teach because it is her escape from the chaos of raising her 4 year old, 2 year old and new born triplets! Dr. Chen is a Physics professor at OBU. He enjoys teaching Physics as well as practice the BaiYang Damoa Gong. He and his wife (Grace) have exercised this martial art for more than 15 years. Both Dr. Chen and Grace Chen will teach this group workout program. The BaiYang Damoa Gong has been introduced as OBU community over 5 years. It is a non-offensive, stretching, and breathing based traditional martial art. Incesstantly practice this exercise will improve the physical condition as well as mental strength. There is no pre-requirement. It is an exercise for all ages and you can join in at any time. Angie Kelly is originally from Kentucky and has lived in Shawnee since 1997. She has been a fitness teacher in the community for the past eight and half years. Angie is a wife, mother of two sons and an instructor of strength classes and also water aerobics at the RAWC. Sheryl Mitchell has a BA from OBU and a MEd from OU. She has taught fitness classes for 16 years. She was the director of fitness classes at the RAC at Southwestern Seminary. Sheryl also was a high school math, history and art teacher, and was Housing Director at OBU. She has four grown children who are all OBU graduates. She and her late husband have served as pastor and pastor’s wife at churches in Oklahoma and Texas. She says that she sees teaching fitness classes as a ministry. She loves to travel and spend time with family. Nancy has been nationally certified as a water fitness instructor and coordinator of water fitness program for over the past 22 years. Nany also holds a master Level Aquatics Fitness Certification as an Instructor, Instructor Trainer, and Personal Trainer through USWFA. She employs a holistic approach in teaching her water and land conditioning classes that will help the individual progress steadily and efficiently. Humor and fun are also an integral part of her classes. Outside of teaching commitments, her main activities are dog rescue and work with OKC-CADP. This is Amanda’s first year to teach Zumba here at OBU. She has taught class from Zumba, Bootcamps and also HIIT classes. She is in the practice for obtaining her Master’s degree in Nutrition and Personal Training. Her and her husband Josh have a two year old energetic little boy named Jude. She picked up this active lifestyle in college and has lost over 150 pounds! She has completed three half marathons and a couple of 5ks. Amanda is thrilled for this new opportunity and blessed by the grace of God to have the chance to start a new journey teaching at OBU. Demita graduated from the University of Oklahoma with a degree in Civil Engineering in 1991 and immediately married her college sweetheart, Eric. She began teaching aerobics in October 1991 because she always wanted to look like Jane Fonda. That never did happen, but she did develop a love for fitness and teaching fitness classes. She worked as an engineer until she decided to change her career to being a full time Mom. She and Eric have three children, Sean, Brooke, and Jill. Demita has recently gone back to work as a Civil Engineer while continuing to enjoy teaching fitness classes.